KIBO is excited to motor into Palm Springs for the annual CUE 2019 National Conference. Stop by booth # 155 to play with KIBO! For three days in March, Spring CUE will be the epicenter of educational excellence and innovation! 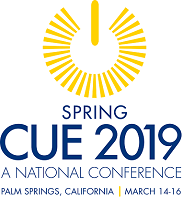 Spring CUE has been the go-to event for educational innovation for almost 40 years – come and see what the buzz is about, find your people, be inspired and raise your game as an educator in the beautiful surroundings of Palm Springs.